The time is nearly upon us. The end is nigh. But apocalypse aside, much more is at stake as the NUEL Summer Tournament approaches Finals Weekend and the Wildcard Tournament. If you missed last week’s recap, here’s all the details you need for the post-season. After one more week of games in the main season, the 13 teams with the most championship points will be invited to continue playing in the postseason. The top 3 teams will automatically qualify for the finals weekend. The next 10 will move into the Wildcard Tournament where they will be competing for the final slot in the semifinals. The finals will be take place over the space of a weekend with best of three semifinals on Saturday 5th September and the best of five grand final on Sunday 6th September. Don’t miss it, because it’s going to be explosive. It was another active week at the top of the standings as a host of new faces have climbed their way up the leaderboard. Some are familiar, some are less so, but they’ve all arrived to spoil the party. Huddersfield White’s win in the final shifts them up to second in the standings, but Amir Is Toxic remains on top. The new faces in the top eight include Spring’s winners the Nottingham Bears while the Sunderland Sneakbeards and Icey Dead People are new additions. We’ll see if they can hold it together as the competition enters its last week before finals. With the competition ramping up there have been some surprising results combined with a number of no-shows meaning a lot of movement up and down the table. However, there have been some teams that have gained considerable ground. In particular, Too Long; Didn’t Reading made an appearance in last week’s final gaining them a large number of points. There were also three teams that gained four places in the rankings after impressing last week They were Huddersfield White (University of Huddersfield), Sunderland Sneakbears (University of Sunderland), UoB Sebbe (University of Birmingham) and Team Same (University of Plymouth). The game started off with standard lanes, neither team particularly committing to anything fancy early on, but with ignite being carried by both supports an aggressive bottom lane matchup looked on the cards. Sure enough, with both duo lanes looking to secure early advantages, a fight broke out resulting in an early kill for Armour onto ViraL’s Jinx, Braum’s passive stacks hitting harder than a Miley Cyrus wrecking ball. With all the action happening in the bottom lane, Koper was quietly building a fifteen creep lead as he used his Shen to bully Stratus Lyte’s Maokai. However, with Nocturne hitting level six, the roam was bound to come in. Sure enough, he swept in to finish Maokai off, but good anticipation from InSec led to a two for two trade under turret. With the other lanes looking rather quiet, the bottom lane took it upon themselves to provide a more spectator friendly game. An engage from Armour went sour and Huddersfield beat a hasty retreat. With Nidalee closing in, they manage to disengage the fight, Braum able to apply his stacks and save Kriz. Meanwhile, little seemed to be happening in the middle lane. With scenes reminiscent of Farmville, the gameplay being only slightly more scintillating, it was all about the roaming. Nocturne’s ultimate allowed him to have more global pressure and good use of it meant that he secured another kill onto Maokai ten minutes in. However, this came at the price of Reading’s middle tower, Azir deciding if he couldn’t roam as well he’d happily get on his tractor and just keep farming. Yet again directed camera spotted a ruckus in the bottom lane, as Sivir went down to Braum after another stun, Alistar headbutting Jinx towards her while not fully taking into account the two stacks already placed on his AD Carry. Simultaneously a Nocturne roamed to the top lane for a kill on Maokai prompting the casters to compare the tree to a “buffet”. Immediately afterwards the two fights became one as, despite a teleport from Shen, Alistar went down as Huddersfield White collapsed on the support and jungler in the bottom lane. 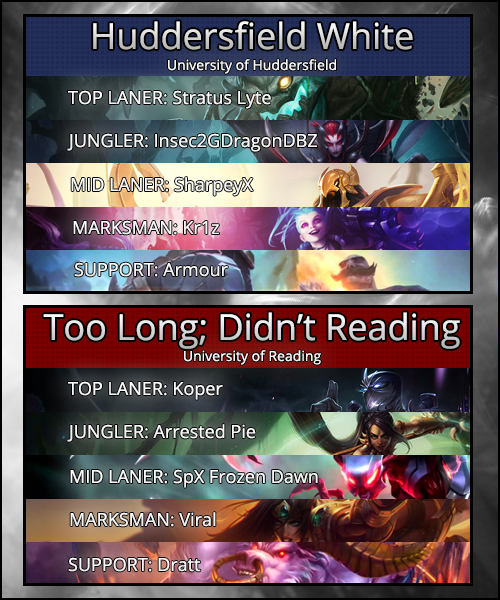 This resulted in the first dragon for Huddersfield, though Reading still had the gold lead due to Shen and Nocturne. It seemed every time Nocturne’s Paranoia came off cooldown, Maokai opened the doors to his five star restaurant. This time the Twisted Treant had pushed up too far and was punished again. In response, four members of Huddersfield sieged the bottom lane. As soon as the turret went down, Armour engaged with Glacial Fissure. Though Alistar managed to get his Pulverise down, he ended up dying for his team. Azir managed to just about chase down Sivir, the heal not quite enough to survive. With Nocturne lacking a way to join the fight, he rotated and took a tower in the middle lane. While the fight had ended Koper decided he wanted some vengeance, but went down after overcommitting onto Jinx. Reading seemed to be playing around Nocturne’s ultimate as an engage on Jinx at nineteen minutes resulted in her death. A neat flash by Frozen Dawn dodged Braum’s ultimate and though the shieldbearer tried his best to disengage, Alistar picked up the kill with an ignite. However, having just won the fight before dragon respawned, some poorly timed recalls, led to Huddersfield White picking up an uncontested dragon. After dragon, Reading seemed overly eager. A catch onto Tract after some rather poor pathing choices in the middle lane led to a full-blown brawl. Reading used the Nocturne and Shen ultimate combination, deleting Kriz. However, the rest of the team were soaking up damage. While ViraL was pretty much untouched, Nidalee pounced in to execute Braum but immediately regretted her decision, the cougar being put down by Azir’s Sand Soldiers. The fight continued, but with the Alistar still low from the initial engage, it was effectively a three on three despite the man advantage. Huddersfield kited back well, SharpeyX on Azir with some great positioning and while dishing out the damage. He managed to take down Nocturne with Stratus Lyte peeling perfectly. As a result Azir and Maokai cleaned up the teamfight, leaving only Shen alive for Reading. It was a four for three trade in favour of Huddersfield. They took the next middle inner turret for their troubles. Having lost the last teamfight, Reading rotated to the bottom lane to take Huddersfield’s inner tower with only the “meal on wheels” Maokai protecting it. However, this left a quick and easy Baron open for Huddersfield White who managed to take it comfortably. As the Baron was secured, Koper taunted the team to buy time for the rest of Reading. Sivir sounded the horns and boosted her team into range and Nocturne used Paranoia to continue the fight, but with no Eye of Twilight to back him up, he was focused down very quickly. All the while, StratusLyte on Maokai had been sowing chaos in the backline of Reading, tanking up three members and preventing them from joining their jungler. They managed to disengage the fight, but the cost was a Baron and two kills to Huddersfield. The gold lead remained close with only a four hundred lead for Huddersfield, but with a Baron buff to boot. With Huddersfield claiming Baron, Reading looked for another opening and in a moment of genius sent Nocturne to the bottom lane to split push. In response Huddersfield sent Maokai down and sieged the top inhibitor. While they succeeded in securing the inhibitor, Frozen Dawn was able to completely ignore StratusLyte. Having taken down the inhibitor, he turned his attention to the slightly perplexed Maokai and cut him down to size. With the possibility of Nocturne backdooring, Huddersfield were forced to make a hasty retreat, but their recalls were interrupted. Only Azir was able to make it back and prevent the second nexus tower from falling as Reading cleaned up another three kills for one. A dragon was secured by Reading off the back of that. With both teams lacking an inhibitor the game slowed down leaving the teams waiting for the second coming of Baron Nashor. As the inhibitors respawned Baron made its theatrical entrance and action returned to the Rift. Reading had set up a one-three-one push in their lanes while Maokai had been sent by Huddersfield to deal with Shen in the bottom lane. With four Huddersfield members in the middle lane, they managed to force a fight by engaging onto Nidalee. While Nidalee managed to escape, Alistar died for her sins. Yet, the underpowered Maokai could not keep Shen at bay and was forced to retreat, losing the bottom inhibitor in the process. With Huddersfield forced to retreat to defend their base, Nocturne and co. made a beeline for Baron, but without a tank to absorb the damage, they were forced off it by the persistence of InSec’s Elise. This opened Baron up for Huddersfield. Nidalee pounced into the pit only to find a missing Baron and the Huddersfied team waiting for her. While Frozen Dawn continued to split push, Huddersfield minus their top laner forced their way down the middle lane taking the tower and inhibitor. A panicked fight broke out with Nocturne attempting the recall. Yet, StratusLyte was able to interrupt it and, after a touch and go fight under tower, was able to secure the kill while surviving on double digit health. But all the action was happening in the other base as it all went wrong for Huddersfield. ViraL was able to lay down the pain securing a triple kill onto the opposition. Alistar became the metaphorical cow in the ointment as he picked up Elise, denying the quadra kill. Nidalee picked up the dragon in the aftermath leaving it two apiece. Both teams were now down an inhibitor and nexus tower resulting in another lull as the teams cleared their respective lanes. A lengthy pause in proceedings had spectators worried, but this Clash of the Titans was not to be halted by technical issues and, with action more exciting than said film to follow, it was worth the wait. With inhibitors respawning, Huddersfield decided to start shoving the bottom lane with Reading still committed to the middle lane. However, Frozen Dawn attempted to position himself for another assassination attempt but was found out by Braum and Elise resulting in a quick kill for the blue team. With Nocturne down, Reading could not contest their bottom and middle inhibitors. As Frozen Dawn respawned, the third inhibitor came under siege. This was the time for a do or die engage. They managed to force them off their inhibitor but did not secure the all important kills they needed. With two lanes pushing, it was an easy Baron for Huddersfield, ArrestedPie again pouncing over the wall to find a missing Baron and some unfriendly faces. Dract attempted to buy some time but it was not enough. An exhausted Nocturne found his damage neutered and without a way to get meaningful punishment onto the carries, the rest of Reading fell in quick succession. The nexus went down and Huddersfield emerged victorious. A close game throughout it was definitely the one to watch. It was tough picking an MVP for this match as many players stood out. Frozen Dawn exploited his roaming potential to great effect during the early and mid game and Armour saved Kriz on numerous occasions. Meanwhile, InSec2GDragonDBZ (please let that be the last time I have to type that out in full) was a constant thorn in the side of Reading on Elise. However, the MVP award has to go to SharpeyX on Azir for his outstanding teamfighting. While he did not have the same map presence as Frozen Dawn, as soon as the game reached a point at which he could contribute he did not disappoint. With impeccable positioning (only dying once) he was able to lay down the pain, ending the match with an impressive 8/1/10, a kda of 18.